..".The eight narrative and thematic chapters, of which the last is devoted to 'the Diffusion of the Traction Trebuchet', fill just over four hundred and fifty pages. They are followed by an extremely helpful Corpus Obsidionum, which has its own separate index, and fills a further three hundred pages. 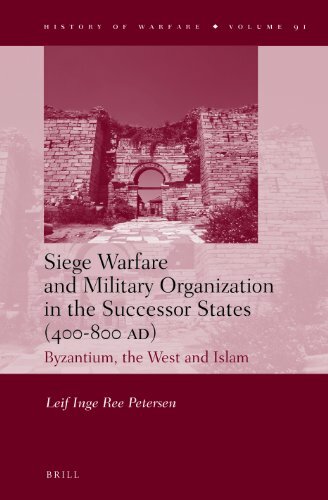 Structured chronologically, the corpus includes all of the episodes of siege warfare the author has found in a very extensive search of the sources, with bibliographical references and a brief synopsis of the evidence and of the events in each case. This is an extremely valuable aid to further research in this and related areas, and would justify publication even just in itself. Added to the impressive if sometimes controversial interpretative section, the result is a work of very considerable and thoughtful scholarship on a topic that has received all too little attention hitherto." ..".The volume is a major achievement and the author deploys his arguments with a wealth of supporting detail. The "Corpus Obsidionum" will prove a very valuable resource." "This exhaustive study, based on the most recent research, will lead scholars to look again at evidence that they thought they knew well. Many scholars have assumed that between the dissolution of the Roman Empire in the West and the Carolingian Empire sieges were insignificant in warfare, because the "successor states" that followed the Roman Empire in the West lacked the military technology, organization, economy, and population to wage warfare on the same scale and with the same efficiency as the Roman Empire had done. Leif Inge Ree Petersen sets out to show that siege warfare did not die out in the West with the fall of the Western Empire and the loss of Roman technology... Petersen sets out a carefully structured case, founded on analysis of a very wide range of primary evidence from both Christian and Islamic writers, as well as critical scrutiny of modern secondary studies.... This is not only a history of warfare in what is still popularly called the "Dark Ages," but also a history of governments and administrative structures. As such, it will prove useful to scholars of later periods... Readers may consider that Petersen paints too rosy a picture of continuity. Nevertheless, the evidence he sets out is persuasive and suggests that we can no longer assume that the successor states were a decline from the Roman Empire, a "Dark Age" of barbarism." Siege Warfare follows the adaptation of late Roman military organization among successor states to 800 AD from Francia to the Caliphate, as siege technology, military infrastructure and administrative techniques throughout the Mediterranean derived from 4th and 5th century imperial innovations.